A great way to have fun with your friends and a few laughs, too. Make one for yourself, or make one for each of your friends, too. Perfect for sleep overs and party favors. Just print and fold. Grab the project sheet from the right and print out the Fairy Fortune Teller from the first page of the PDF. 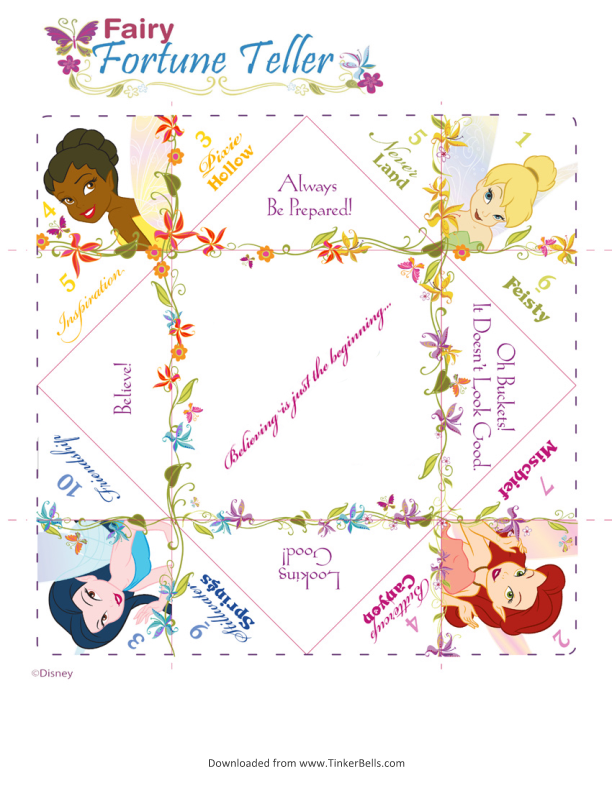 Cut of the Fairy Fortune Teller. With the printed side down, fold each of the four corners into the middle. Turn the paper over so the fortunes, are face up. Fold each of the corners into the middle. Fold the paper in half, right to left, crease and unfold. Fold the paper in half, top to bottom, crease and unfold. With the characters face down, hold the fortune teller in your right hand, then slip your thumb and forefinger into the flaps of the bottom of the left side. Pinch left thumb and forefinger together so that you’re holding the Fairy Fortune Teller in your left hand. Then do the same with your right thumb and forefinger under the remaining two flaps. Hold the Fairy Fortune Teller together with your thumbs and forefingers. Have a friend ask a yes/no question and then have them choose one of the four corners. Count out loud the corresponding number of the corner by moving your fingers away from your thumbs and back together and then moving out to the sides and back together until you’ve finished counting. Once you’ve finished, have your friend choose on of the fairy locations or fairy descriptions that is showing inside. Count out loud the corresponding number above the word and repeat step 2. Once you’ve counted out the right number have your friend choose one another fairy word. Say “The Fairies say….” and unfold the flap of that word to reveal the answer to the questions and your fortune. Have fun and change the rules any way you like. After all, you control the Fairy Fortune Teller!